Anyone with a CCW will, at some point in their life, have to use a public bathroom stall. If you are just carrying a small revolver or auto in a pocket, this is not a problem, but if you're wearing a serious pistol on your hip there are some things you need to take into account before you take a seat. This can be a very awkward situation. 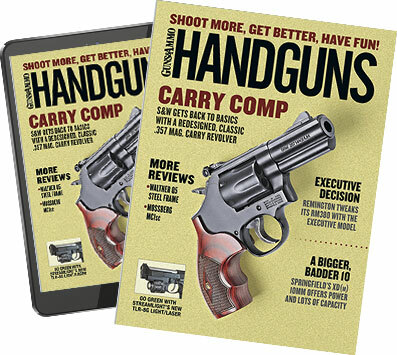 I've never accidentally kicked my gun across a bathroom floor or dropped it into a toilet bowl, but I once had the magazine release spring on my Glock crack, so as I took the pistol out of the holster to set on the back of a toilet at a McDonald's the magazine dropped free andâ€”splash!â€”nothing but net. I am providing these tips because I have been carrying a gun long enough that anything that can go wrongâ€¦has happened to me. My pain is your gain. Disrobingâ€”when undoing your belt and lowering your pants, you will need to keep hold of your pistol/holster. If you don't, and just hold onto your pants and/or belt, there is a very good chance that holster will flip upside down and puke your pistol onto the floor. Will that pistol break when it hits the tile? Probably not. Will it stay where you can reach it and not slide across the floor towards the door? Maybeâ€¦..
Where should I put this?â€”if you leave the pistol in the holster when your pants are around your ankles, it is likely to fall over and just lay on the floor. This probably isn't the best idea. So, what should you do with the gun while you're otherwise occupied? You could put the pistol on the floor next to the toiletâ€¦.but do you really want to set your gun on the floor of a public bathroom, right next to the toilet? You're going to have to wash more than your hands when you get out of that stall. Also, those stall doors/walls do not usually go all the way down to the floor. That means than not only might your holster sitting around your ankles be visible to any bathroom visitors, a gun sitting on the floor probably is as well. I tend to twist my pants around my ankles so that my holster is behind my legs and either not visible or not easily identifiable as a holster. Putting your pistol on the back of the toilet, on the tank lid, is an option, if the toilet has a tank and lid. Many public toilets don't. If you decide to go the tank/lid route, make sure that lid is more or less flat, otherwise that pistol will slide right off when you are otherwise occupied. Also, when you have completed your transaction, don't forget to grab your pistol before you leave the stall. I know a Michigan State Police Trooper who left his backup piece sitting on a toilet of a restaurant bathroom. Luckily the owner of the restaurant knew the trooper personally, so when his mentally handicapped employee brought him the gun he'd found in the bathroom (yep, all sorts of things could have gone wrong there) he just called the trooper, and that trooper went back and quietly picked up his gun, kept his job, and learned an important lesson. There is no good answer to where you should put your pistol when you're sitting there. As a last resort I sometimes lay my pistol flat inside my pants around my anklesâ€”that way it is neither touching the floor nor visible to anyone else. Reholsteringâ€”Once you're done with your business and fully clothed, it will be necessary to re-holster your weapon. If you use a leather holster, no one will hear this. If, on the other hand, your holster is made out of kydex or some other synthetic, re-holstering may generate a surprising loud and (to some people) identifiable sound. My advice? Flush the toilet with one hand while reholstering with the other.